The idea behind this circuit was to model the detection of the fluorescence emitted by the bacteria: if we apply an intense source of light directly to the light-to-frequency converter (which is the same than the one used in the prototype), it models a great intensity of green fluorescence (and thus supposedly a large concentration of Arsenic in the sample). If no light is applied, the light-to-frequency converter only senses ambiant light which models the situation when the concentration of Arsenic is so low in the sample that not much fluorescence is emitted by the bacteria. 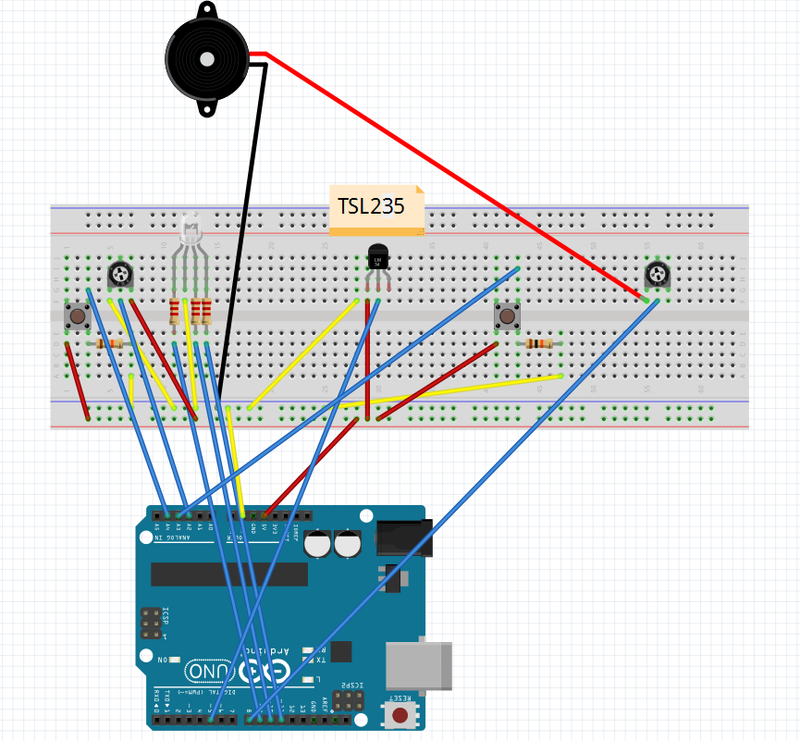 The basic components of this circuit are the light-to-frequency converter (TL235), a piezo speaker (to produce sound) and the arduino manage the input and output of the components. We also added a RGB LED to keep visual information, two potentiometers to modulate the sound produced by the piezo and two buttons to be able to choose two different musics. Unzip Music_Box.zip and open the MusicBox.ino file in the Arduino Software. Branch the USB cable of the Arduino to your computer. 1) When you push the button, the device starts counting light intensity. should mean in the final prototype that the arsenic concentration is too high in the sample). 3) After hearing the second music, you can push the button and the counting will start again. (only for the music when the prototype is counting). note: if you want to test a strong light intensity, you have to add a source of light in front of the light-to-frequency converter (from your mobile phone for example).